One of the most beloved and bestselling novels of spiritual adventure ever published, Ishmael has earned a passionate following among readers and critics alike. This special twenty-fifth anniversary edition features a new foreword and afterword by the author, as well as an excerpt from My Ishmael. Must have an earnest desire to save the world. Apply in person. It was just a three-line ad in the personals section, but it launched the adventure of a lifetime. So begins an utterly unique and captivating novel. 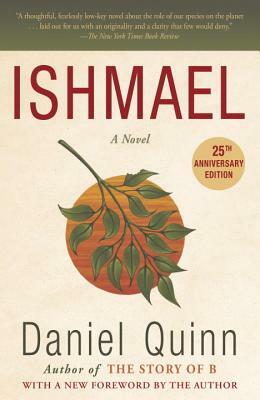 In Ishmael, which received the Turner Tomorrow Fellowship for the best work of fiction offering positive solutions to global problems, Daniel Quinn parses humanity’s origins and its relationship with nature, in search of an answer to this challenging question: How can we save the world from ourselves? Daniel Quinn grew up in Omaha, Nebraska, and studied at St. Louis University, the University of Vienna, and Loyola University of Chicago. He worked in Chicago-area publishing for twenty years before beginning work on the book for which he is best known, Ishmael. In 1991, this book was chosen from among some 2,500 international entrants in the Turner Tomorrow competition to win the half-million dollar prize for a novel offering “creative and positive solutions to global problems.” It has subsequently sold more than a million copies in English, is available in some thirty languages, and has been used in high schools and colleges worldwide in courses as varied as philosophy, geography, ecology, archaeology, history, biology, zoology, anthropology, political science, economics, and sociology. Subsequent works include Providence, The Story of B, My Ishmael: A Sequel, Beyond Civilization, After Dachau, The Holy, At Woomeroo, The Invisibility of Success, and The Teachings. Daniel Quinn died in 2018.